Remember Eutychus? He’s the guy who falls from a third floor window when he nods off during a sermon. Maybe that’s a warning for listeners – but Gary Millar and Phil Campbell see it as a lesson for preachers instead. In this challenging, practical and sometimes light-hearted book, two veteran preachers from opposite sides of the world set out to help both new and old preachers keep people awake long enough to hear the transforming words of God. 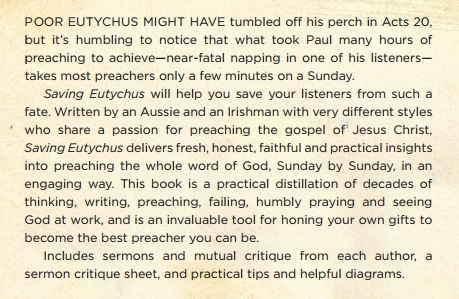 The international version of Saving Eutychus is available now. Order here. Australian release June 2013. For more information, visit Matthias Media.